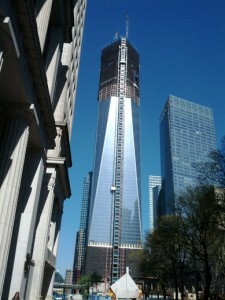 Name the tallest building in New York City? For the past 10½ years it was the iconic Empire State Building. No more. As of last week, that honor belongs to the new One World Trade Center, now more simply known as 1WTC and previously known as Freedom Tower. It was a big news story here in New York. Did you hear about it? For me 1WTC is less about what it is — a building — than what it stands for — the commitment to building something bigger, better and bolder. Think about it. A building is static. The act of building is active. A building is about what is. Building is about what can be. A building is the embodiment of how things were. Building is about forward progress and reaching higher. Why is the notion of building so important — especially now? Because doing the opposite — not building — is a path to nowhere. Why? Consider the speed at which everything is changing. Consider how innovation lifecycles are shorter and shorter. Consider our easy access to just about anyone and any market. Consider the thousands of entrepreneurs and billions of investment currency committed to challenging conventional wisdom and current market leaders. Taking pleasure from past success may be comforting, but it’s delusional. Continuing to operate in the same manner and style as how it’s always been may feel familiar, but it’s an insular trap. A new workout routine ceases to produce new results after six weeks. Budgeting off of past year models is an inside-out view that doesn’t reflect what’s going on in the market. Managing off of organizational practices built for productivity and efficiency will not produce the innovation and breakthroughs needed to prevail in a highly dynamic and fiercely competitive economy. You have a choice. Remain as you are. And stay how you’ve been. Or courageously commit to aggressively building a bigger, better and bolder future for yourself and your organization. 1WTC may have eclipsed the Empire State Building as the tallest building in New York City, but it is committed to building the tallest building in the Western hemisphere and third largest in the world. Now that’s ambition. The question is: Are you a building? Or are you building for a better future?